Finally got this project started. 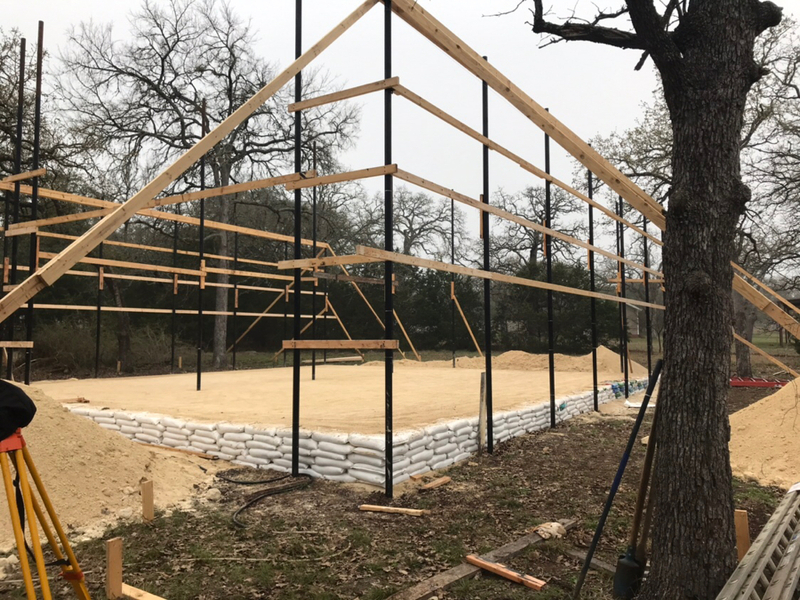 42’x48’ with 16’ walls using 2 7/8” drill tubing columns with concrete floor. One 14x14 door on one side and a 18’x10’ door front and back on the other. Oh yeah this is good going to be awesome. I am into this build. Looking forward to the next update. Nice , what made you go with drill stem and not telephone poles . Thanks, no particular reason on not using telephone pole. Always had it in my head to use tubing. Following, have to do one also. I’m going to build one in the future . I already have the poles and metal. Looks great! I will be following this one. Good luck! It’s coming along great. We put in another good day today getting prepped for the trusses next weekend. I’m happy to be a part of this build. (rzurovec is my uncle). I’ve got a couple of pics. Here some pic of getting the base in. Good job today Bryan. Willing to bet they do the wood forms just outside these bags leaving perimeter beams but I could be wrong. Thanks. Yessir the outer beam will be 3” outside of the post and 4” higher than the bags to make the the floor. After the poly, steel etc. The fill bags are used on the high side and are tamped down as you lay them. They give you a “stop” to compact your fill too. You’re right. The forms for the turn down beam will go outside the post. Today was truss day. 42 footers, 271 lbs each. Called in the mules. 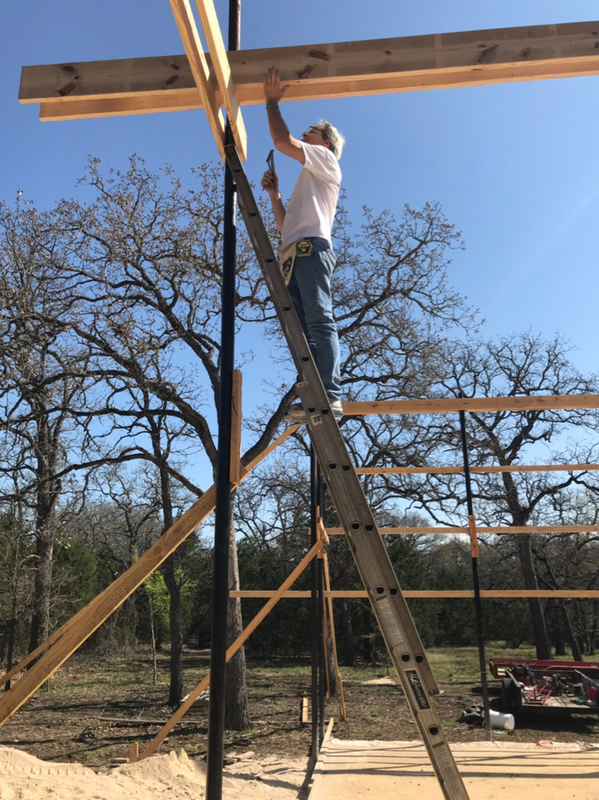 Did you built the trusses or buy them ? Wow those trusses look awesome. Coming along nicely. Bought the trusses. 2x6 top and bottom cords made to accommodate 4’ spacing and reinforced where they catch the middle beam. Where did ya buy them ? I was going to build my own but having second thoughts. Ordered them from a local outfit called Trussmate. You could probably find someone closer to you. Looks great Just a thought for those planning on a barn or shop. and used 5 purlin's on each side. Bolted the truss's to the 4x 6. There is a 20 ft span between trusses . Used self tapers to secure every thing. Wow, I can't believe you put those up by hand. Otherwise y'all are doing great! It looks amazing! Got the pearlins on a couple of weeks ago then stalled out with the rain. Got back to it today and completed the roof except for ridge cap. 32 21 1/2’ sheets were bulky but went on pretty easy once we got ‘em up high. All those sandbags makes my back hurt. But the barn is looking nice! Thanks. Lucky for my back a couple of young men from the high school filled ‘em. What a great build! Thanks for sharing.